Japanese information and technology (IT) firms have been expanding their investment into Viet Nam and hiring more Vietnamese workers, according to experts at the Viet Nam-Japan ICT Day held in Ha Noi on Wednesday. 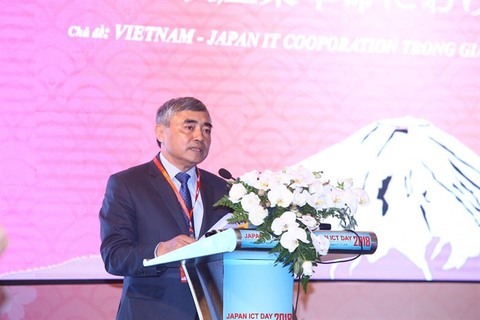 Deputy Minister of Information and Communications Nguyen Minh Hong delivers a speech at the Viet Nam - Japan ICT Day 2018. A survey by the Ministry of Internal Affairs and Communications in 2017 showed that the rate of applying artificial intelligence (AI) at Japanese companies was only 1.9 per cent. However, the demand for newly arisen technologies such as the Internet of Things (IoT), AI, robotics and self-driving cars in Japan has rapidly increased while the country faces a shortage of around 171,000 IT engineers. It is expected that Japan will lack 369,000 IT engineers specialising in new technologies by 2020. “The shortage of high quality human resources and increasing demand for engineers in the new technologies will open a huge co-operation opportunity for both Japanese and Vietnamese companies in the upcoming time,” said Hironobu Kitagawa, Chief Representative of the Japan External Trade Organisation (JETRO). He said Japan defined Viet Nam as one of its potential markets for investment. Japan has invested in 54 IT projects into Viet Nam, accounting for 19.6 per cent of the total FDI projects in the country. The investment by Japanese enterprises into Viet Nam is expected to increase in the coming time. According to the US technology company HackerRank, Viet Nam has potential for software development as it took the first position in Southeast Asia and 23rd in the world in the industry. “Human resources has always been strength of Viet Nam in the ICT sector,” said Nguyen Doan Hung, vice chairman of Viet Nam Software & IT Services Association (VINASA). Currently, Viet Nam has 290 universities and colleges providing training to people in the IT sector, educating 55,000 students a year. “The Fourth Industrial Revolution together with new technology trends such as IoT, Ai, Big Data and the digital transformation as well as abundant human resources will open big co-operation opportunities for Viet Nam,” Hung added. Deputy Minister of Information and Communications Nguyen Minh Hong said the co-operation between Viet Nam and Japan had been promoted at the management level and between businesses with support from the IT associations of the two countries. The Vietnamese Ministry of Information and Communications and Japanese Ministry of Internal Affairs and Communications signed various comprehensive co-operation agreements addressing information security, postal and IT human resource training. In addition, the two sides have promoted an action plan to develop the electronics industry via Viet Nam – Japan co-operation by 2020. In the software sector, Japan has still been a big market for Vietnamese firms. Most Vietnamese software enterprises have seen surging turnover after participating in outsourcing and exporting software into the Japanese market. Viet Nam has been named among the Top 10 attractive countries in terms of software outsourcing. Export turnover from software outsourcing rose 15 per cent a year. Of these, software exports to Japan made up a big portion. Hong expected that IT companies would join and support the Government and the ministry in building e-Government in Viet Nam. “The Government has promulgated a decision to establish a national committee for e-Government. The ministry of Information and Communications has also been building a project for national digital transformation and will submit it to the Government in the upcoming time to take advantage of the Industry 4.0,” he added. Japan ICT Day 2018, themed “Viet Nam – Japan IT Co-operation in the 4th Industrial Revolution”, took place in Ha Noi and the central city of Da Nang from August 28-31. The event, hosted by VINASA, is part of activities to celebrate the 45th anniversary of the establishment of diplomatic ties between the two countries.